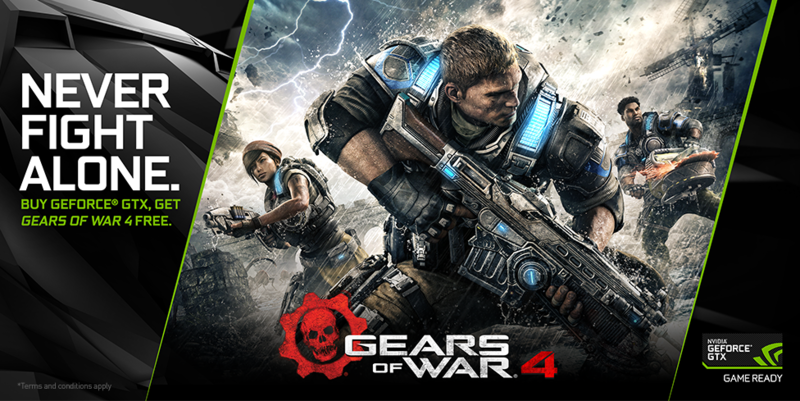 Nvidia has launched a new game bundle today that gives buyers of either the GeForce GTX 1070 or GTX 1080 a free copy of Gears of War 4, the upcoming third-person shooter from Microsoft Studios and The Coalition. Gears of War 4 will be bundled in the box of not only GTX 1070 and GTX 1080 graphics cards, but also in laptops that use the notebook GTX 1070 and GTX 1080 variants. As with all GPU game bundles, not every product in every retailer is eligible, so make sure your favorite store supports this deal before going ahead with a purchase. The Gears of War 4 code that will be included with these graphics cards falls under Microsoft's Xbox Play Anywhere program, so gamers can activate the code on their Windows 10 desktop and play it on an Xbox One without having to purchase the game twice. It's a nice bonus for people who own a gaming PC and an Xbox One. Microsoft suggests that the GeForce GTX 1080 will be suitable for playing Gears of War 4 at 4K resolution, while the GTX 1060 will suffice for 1440p, and the GTX 750 Ti is enough for 1080p. Nvidia has a handy webpage that details which retailers across the globe are participating in the Gears of War 4 bundle. Across North America, all the biggest retailers such as Newegg, Amazon and NCIX are participating, along with a wide variety of board partners and system builders.